Haute Cuisine meets midweek convenience in this fusion of a classic Imperial Russian recipe and a handsfree favorite. Count Stroganoff would probably have a heart attack as would his famous French chef at the idea of this kind of riff on Beef Stroganoff, their signature dish, but guess what? We’re not going to stress about a Russian count and a French chef who have been dead for 200 years. Not when there are meatballs to make. I’ve written before about Beef Stroganoff’s invention and round-the-world there-and-back journey. But that was a while ago, and I thought it was time to revisit this Russian classic that made its determined way into the global culinary canon. And then I was visited by one of those culinary accidents that produce the best family classics. I’m in the midst of working on developing an updated recipe for a funny sort of Estonian meatball soup and the meatball part of the equation was driving me up the wall. All of the Estonian recipes gave me meatballs that fell apart in the broth or were too tough to be enjoyable. To be successful, meatballs need to have that almost-impossible to achieve texture: tender but firm. And so, I went wandering, as I tend to do, through the Internet and a stack of cookbooks for a solution and was surprised to learn that the solution was to freeze the meatballs raw, then cook them low and slow in a slow cooker or braise them in a Dutch oven in a bit of broth before adding them to the soup. I was skeptical but desperate, which is the moment when many truly great recipes come in to being. 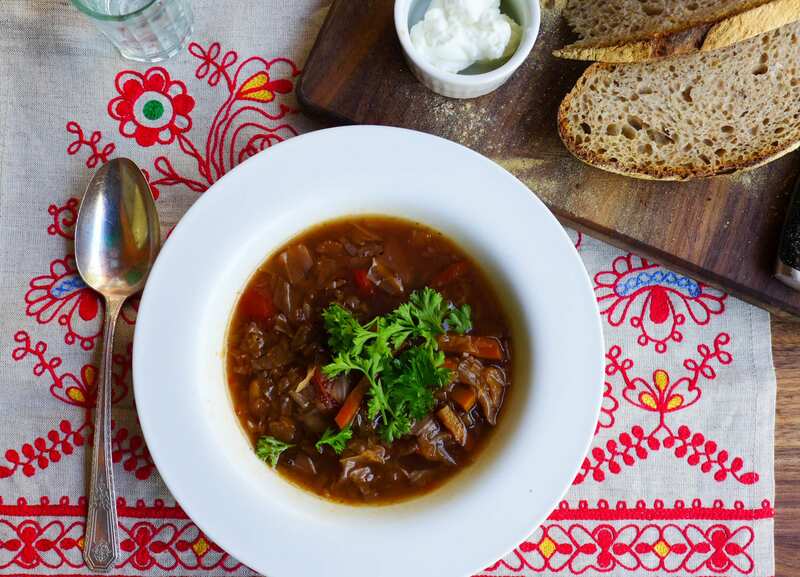 This worked a treat and I’m happy to say that Estonian meatball soup is now delectable! But now I was on a serious meatball jag — there is something really satisfying about having a bag of meatballs in a Ziplock in the freezer that you can pull out in an emergency. These are great with Bolognese Sauce or in chicken broth with a bit of spinach and grated Parmesan. Stay tuned for the final recipe for Estonian Meatballs soup. This past week we celebrated Men’s Day in Russia — that most masculine of holidays. 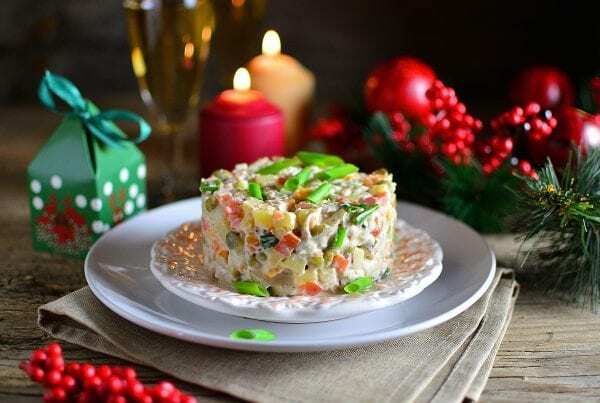 This is arguably the most important holiday of the Russian calendar year in terms of the need to have a really great, super hearty showstopper menu ready! Explore my Men’s Day Menu for The Moscow Times. Readers of Lenin Lives Next Door will remember that Men’s Day is the moment when Jesus and Alexei get engaged, with the Cartier rings and the Pratesi sheets. They may be the only men to ever celebrate Men’s Day in this particular way, but as they are fictional, I think they’re safe! In a sequel, I’m working on (very slowly) Jesus gets a friend (me, who else?) to make a big pot of Beef Stroganoff (which is Alexei’s absolute favorite) to serve when his mother-in-law arrives from the Crimea. You can imagine what happens next. (Hint: not a cozy family dinner). Beef Stroganoff is always a crowd-pleaser, but it’s fussy and messy and you can’t really do a lot of ahead-of-time heavy lifting. 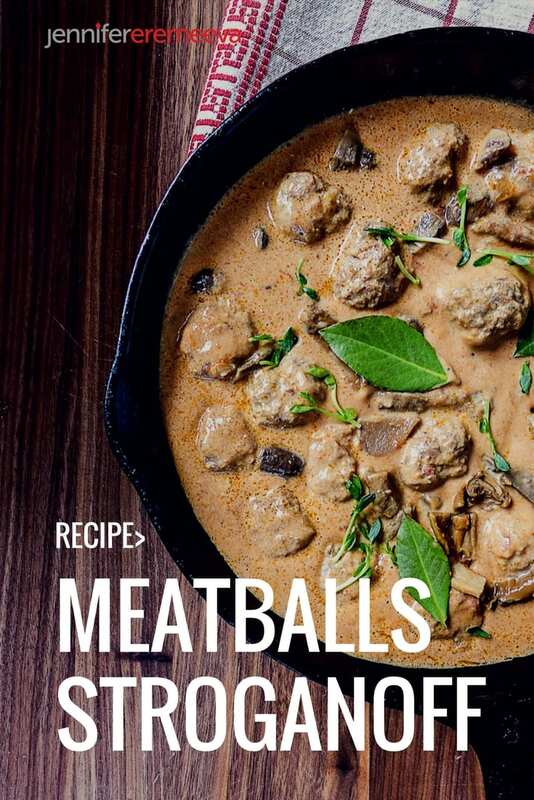 These meatballs fuse the flavors of Beef Stroganoff with the meatballs for a “get it going, then leave it alone” type of main course that frees you up to scour your apartment from stem to stern before your mother-in-law arrives to stay for seven or eight months. You know the sort of thing. 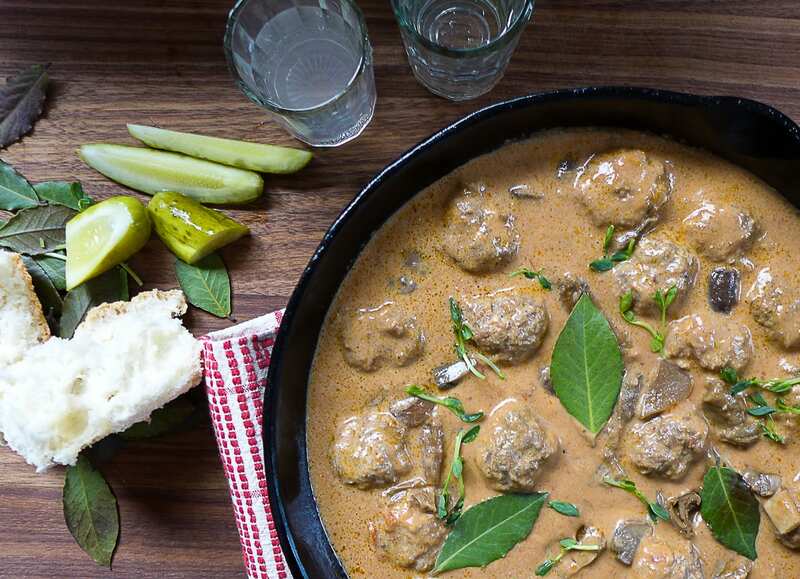 Meatballs somehow make this classic imperial Russian dish a little bit more accessible; you might not pack the remains of Beef Stroganoff in your lunchbox, for example, but you certainly might stick these babies in. Tradition and convenience team up in this new interpretation of an Imperial Russian classic. 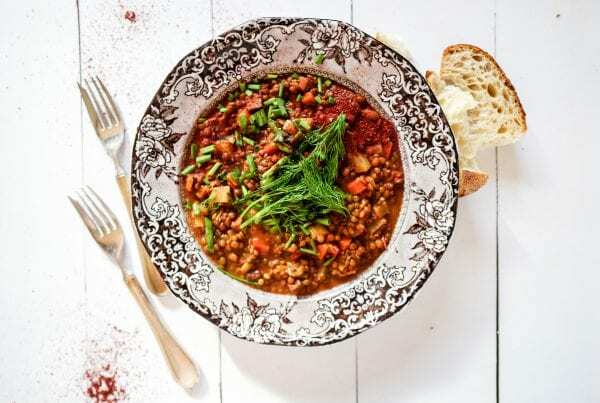 In a large mixing bowl combine the ground meat, chopped parsley, and pancetta - use your clean hands to knead together. Whisk together the egg, egg yolk, anchovy paste, and the Worcestershire sauce, then add the mixture to the meat, along with the breadcrumbs, cheese, onion powder, allspice, paprika, salt, and pepper. Knead together with your hands until combined. Cover the mixing bowl with plastic wrap and let stand at room temperature so that the flavours come together for 10-25 minutes. Line a cookie sheet with parchment paper. Whisk together the flower, cayenne pepper, and salt in a shallow pie dish. Use your hands to form small balls of meat approximately 1 inch in diameter. 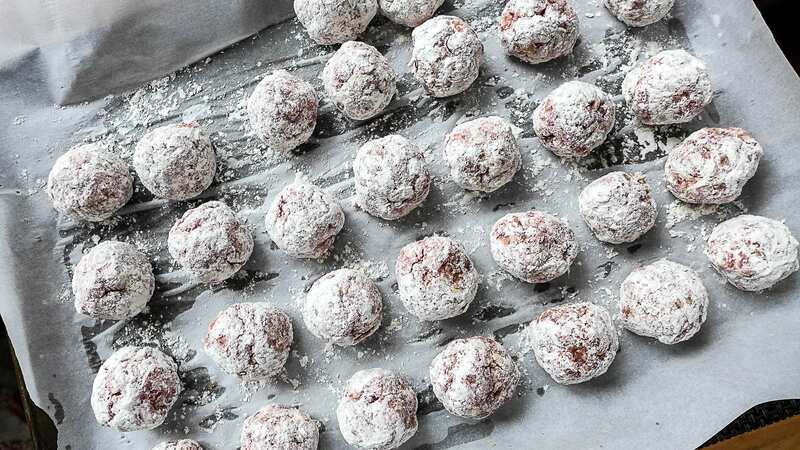 Roll each ball in the flour mixture and place on the cookie sheet, leaving room between each ball so that they don't stick together. Place balls in the freezer for at least 3 hours. At this point, you can store the balls for future use by placing them in an air-tight container. Prepare the ceramic of your slow cooker with a thin film of oil. Place the dried mushrooms in a bowl and cover with the Marsala wine and hot water, using the back of a spoon to submerge the mushrooms under the liquid. Let stand for 20-25 minutes. Sweat the onions in one tablespoon of the butter in a deep saucepan, then transfer them to the ceramic of the slow cooker. Place the bay leaves on top of the onions. Wipe out the interior of the saucepan, then melt the remaining butter, then saute the fresh mushrooms over medium heat until the mushrooms have leeched all of their liquid and begin to re-absorb it (approximately 15 minutes). Drain the rehydrated mushrooms through a piece of cheesecloth, retaining the liquid. Add the rehydrated mushrooms to the saucepan and toss to combine. Layer the mushrooms on top of the onions in the slow cooker. Remove the meat balls from the freezer and place them carefully in layers inside the slow cooker on top of the mushrooms. Whisk together the beef broth, the liquid from the rehydrated mushrooms, the tomato paste together. Add in the chopped tomatoes and sugar and use a hand-held mixer or ricer to pulverise the tomatoes into the liquid. Pour the liquid over the meatballs and cook on the low heat setting for 5 hours. When the meatballs have cooked for 5 hours, use a slotted spoon to transfer the solids carefully to a cookie sheet or mixing bowl. Whisk in the sour cream to the remaining ingredients, then carefully replace the solids into the slow cooker. Replace the lid and let cook for another 40 minutes on low heat. Remove the bay leaves before serving. Sweat the onions in one tablespoon of the butter in a deep, heavy-bottomed Dutch Oven and cook until they are translucent. Add the remaining butter, then saute the fresh mushrooms over medium heat until they have leeched all of their liquid and begin to re-absorb it (approximately 15 minutes). Add the rehydrated mushrooms to the Dutch Oven and toss to combine. Add the bay leaves. Remove the meat balls from the freezer and place them carefully in layers on top of the mushrooms. Pour all but one cup of the combined liquids over the meatballs and cook in the preheated oven for four hours. When the meatballs have cooked, use a slotted spoon to transfer the solids carefully to a cookie sheet or mixing bowl. Discard the bay leaves. Bring the liquid to a simmer on the stove top, then whisk in the sour cream. Stir with a wooden spoon for 7 minutes on low heat while the mixture thickens. 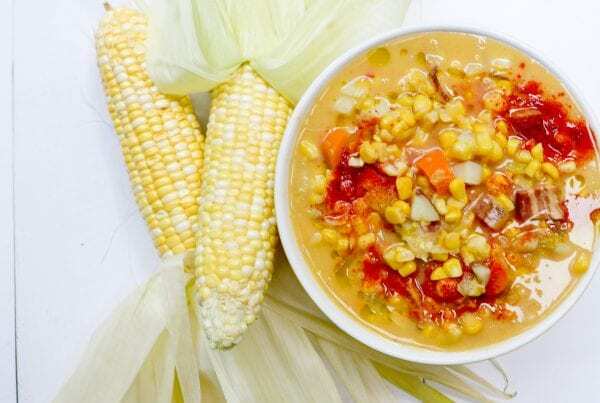 Replace the solids gently into the Dutch Oven. Serve over rice, fingerling potatoes, or egg noodles. Garnish with a dollop of sour cream and fresh chopped parsley. Beef Stroganoff is usually served with fingerling potatoes, rice, or egg noodles but these meatballs worked equally well with “zoodles” or “zucchini noodles” — a much lighter alternative to traditional starch for those of us who are trying to watch the carb intake. So, go on a meatball jag and have fun! And report back here! from step 15 this otherwise very delicious recipe looks somewhat like a repetition of earlier steps. I guess this is just a mistake. Thanks so much, Wolf, for the heads up! It’s actually two slightly different methods of cooking. I’ve amended the recipe to reflect this and I really appreciate you pointing this out! Enjoy the meatballs!